The hapless spin doctors of Myanmar’s embattled National League for Democracy (NLD) government have made a belated gambit to stave off international pressure aimed at seeking accountability for military abuses in Rakhine state against minority Rohingya Muslims. It’s their apparent hope that the formation of a domestic commission of inquiry (CoI) – rather than allowing in United Nations or other independent foreign investigators to probe the situation – will set the record straight on the allegations of “ethnic cleansing”, once and for all. The announcement of the CoI’s creation on May 31 coincided with the signing of a Memorandum of Understanding with the United Nations High Commissioner for Refugees (UNHCR) and the UN Development Program (UNDP) to assist in the repatriation of an estimated one million Rohingya refugees now languishing in abysmal camps in neighboring Bangladesh. For the usually defensive and dogged NLD, the CoI is a veritable storm of initiative. The Office of the President announced the commission “will investigate the violation of human rights and related issues following the terrorist attacks by ARSA (Arakan Rohingya Salvation Army)”, a Rohingya insurgent group active in Rakhine state. The announcement also said the CoI will “consist of three members including an international personality, and will be assisted by national and international legal and technical experts.” Speculation is now rife about who the government aims to tap as the commission’s “international personality”, a crucial selection if the CoI is to have any international credibility. There are few international “personalities” who would seriously countenance the role now, given the reputation risk it would entail, especially following the spectacular showdown between State Counsellor and de facto national leader Aung San Suu Kyi and former US ambassador to the United Nations Bill Richardson. Richardson served briefly as a member of a government advisory board comprised of Myanmar and foreign nationals on Rakhine state. The board was established to advise the government on implementation of the 88 recommendations made by the Rakhine Advisory Commission led by former UN Secretary General Kofi Annan. The commission submitted its final report just hours before ARSA attacked security forces in northern Rakhine state on August 25. At the first meeting of the board in early 2018, Richardson, a former governor of the US state of New Mexico, tried to raise the issue of the two incarcerated Reuters journalists who had reported on a Rakhine state mass grave with Suu Kyi, who, in the ex-governor’s telling, exploded at him. In a rare interview last week with Japan’s NHK, Suu Kyi said “we will only appoint people in whose integrity and whose ability we have full confidence” to the new CoI. Nationalist parliamentarians, including members of the former ruling, military-backed Union Solidarity and Development Party (USDP), have ramped up resistance to the CoI. On June 11, in a motion to overturn the commission’s formation, parliamentarian Sai Kyaw Moe and 20 other MPs called on the government to reconsider the motion for reasons of national sovereignty.Other MPs, including military appointees, have echoed the government’s line of the past year that allegations of “ethnic cleansing” were based on “fake news” and exaggerated Western media and rights groups reports. 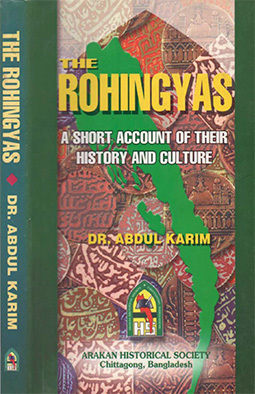 They believe international pressure aims ultimately to give citizenship to Rohingya they consider illegal immigrants and carve out an exclusive Rohingya enclave in northern Rakhine state. It is not clear whether MPs or government officials are fully cognizant of the complexities of international justice initiatives or clearly understand the seriousness of the investigations gathering pace around Myanmar, which some suggest could lead to debilitating new sanctions if “crimes against humanity” and “ethnic cleansing” allegations are proven to be true. Those cases are slowly but surely being made. In late April, UN Security Council members visited Rohingya refugee camps in Bangladesh and then traveled to Myanmar. At a press conference regarding the trip, Karen Pierce, permanent representative of the United Kingdom to the UN, said that the stories they had heard at refugee camps in Cox’s Bazaar were bad, but that stories were different from a proper investigation. 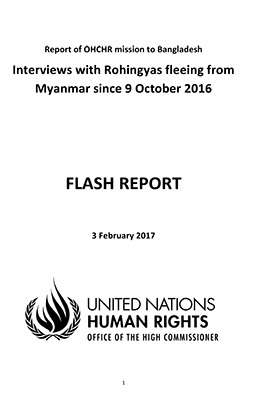 The UN’s Fact Finding Mission (FFM) to Myanmar, first mandated in March 2017, well before the military “clearance operations” that started in late August 2017 and forced over 800,000 Rohingya refugees to flee into Bangladesh, has not been permitted to conduct investigations inside Myanmar. The FFM’s three experts and a team of investigators have instead pursued research in neighboring countries seeking details on patterns of abuses by security forces as well as government and non-state actors. That would indicate they are also likely investigating ARSA abuses and other armed groups for abuses. The FFM will present its report to the General Assembly in September and likely refocus international attention on the scale of atrocities involved in the military’s clearance operations that commenced last August 25 in response to ARSA attacks on security outposts. 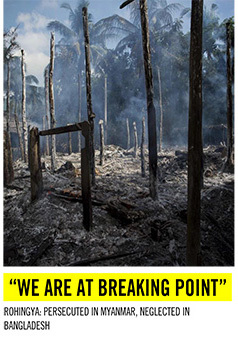 There is also the potential for an International Criminal Court (ICC) investigation, a prospect that is clearly vexing Myanmar parliamentarians, government officials and military leaders alike. It has some promise of success as neighboring Bangladesh is a party to the treaty, meaning the ICC technically has jurisdiction. The ICC has requested Dhaka to provide written observations on the circumstances of the Rohingya in Bangladesh. Bangladeshi Prime Minister Sheikh Hasina appealed to world leaders at the G7 Summit held recently in Canada to keep the pressure on Myanmar to ensure accountability for crimes committed against the Rohingya. Previous government commissioned investigations into abuses against the Rohingya have been widely dismissed as insufficient, if not clumsy cover ups. Yet there is no doubt that the NLD has finally woken up to the need to do something to make the mass crimes perpetrated in Rakhine state somehow explainable to the West. China, Russia, and to a certain extent Japan and members of the Association of Southeast Asian Nations (Asean), apart from Muslim majority Malaysia and Indonesia, don’t seem to care much about the violence and want to get back to business as usual. But it is clear that pressure for justice and accountability from the US, UK and UN will not abate any time soon. The arrival this week of newly appointed UN Secretary General Special Envoy Christine Schraner Burgener is another opportunity for the Myanmar government to show some measure of contrition and a genuine spirit of cooperation. But this will always be calibrated to maintaining an air of disdain for what the regime views as ill-informed international criticism. Naypyidaw can announce as many inquiries as it desires, but it’s sincerity is still obviously in short supply.